Our teens know more about addiction than we give them credit for. School programs that start at a young age teach children about the behaviors associated with addiction, and their natural curiosity makes them keenly perceptive of what’s going on at home— they noticed when something feels off, especially when it concerns their own parents. While they might not see you drinking, that doesn’t mean they can’t smell alcohol on your breath, notice a change in behavior or recognize old excuses. Lying about our actions and covering them up can establish an atmosphere of distrust and discourage our children from confronting their own challenges head-on. And without an explanation for out-of-character behavior, children may blame themselves and invent their own explanations, which can be damaging to their self-worth and sense of belonging. Honesty can be a refreshing policy: it sets the stage for a better, more open and more trusting relationship. And sharing an intimate story that makes you vulnerable can help them see you not just as a parent, but as a person. This kind of relationship arms your teen with defenses that help them stand up to peer pressure and lets them know they can come to you in times of doubt. And should they make mistakes, they can feel safe opening up to you about their experiences. Despite the moody, hormonal attitude that is so easy to recognize in young teenagers, your opinion, your approval and your attention mean more to your child then they will ever let on. You have a bigger influence than you think! Sharing your story—talking about temptation, peer pressure, cravings, guilt, frustrations, regrets—can help deglamorize drug and alcohol use and help your teen understand that people become addicted without intending to. Let your story be a dose of preventative medicine—help them learn from your story without having to make the same mistakes and suffer the same consequences that you did. Before you sit down with your teen, make time to reflect on what you want to say. Remember, you have to be honest with yourself before you can be honest with others. When you’re thinking about your story, resist the urge to embellish, make excuses or assign blame to others. Do your research too. Learn the facts and see how others have handled similar conversations. 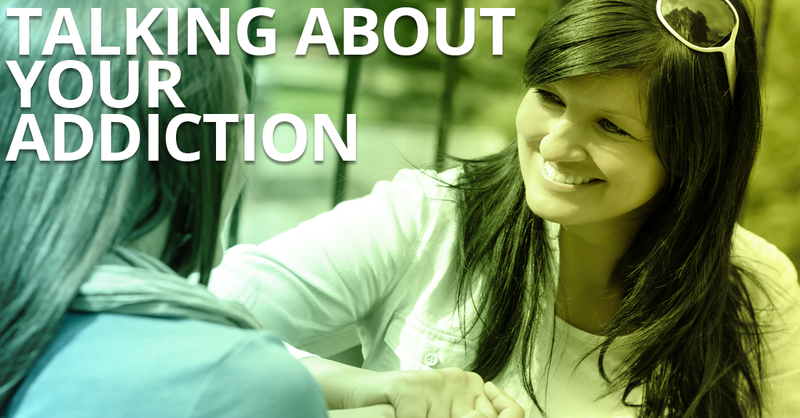 This will help you better respond to questions and talk about the objective facts of addiction. Set aside a moment when stress is low, distractions are clear and you have time to have an intimate conversation. Don’t try to hammer everything out in one session—that can be overwhelming. Give your teen time to process what you’re saying and break the conversation into small chunks that keep it going—multiple small conversations are more effective than one big lecture. We can’t tell you exactly what to say—that’s up to you. However, there are a few guidelines that can help keep your conversation open and productive. Be honest. How much information you share is up to you, but lying isn’t a productive exercise. If you’re not ready to talk about something specific, don’t lie. Tell them you’re not ready to discuss that issue yet, but that you’ll come back to it when you’re ready. Don’t insult yourself and try not to make sweeping generalizations that illicit pity. Saying “I’m the worst parent ever” isn’t constructive and can unintentionally make your teen feel like “the worst child ever. Don’t rush. Give your teen time to process what you’re saying, ask questions and respond. They might not want to reciprocate the conversation right away—it’s OK to give them space to sort out their feelings and think about how they want to respond. Don’t penalize their reaction, or negate their feelings. Allow them to the freedom to express how they feel with their words. Once you’re done talking, let them know the conversation isn’t finished and that they can come back to it whenever they feel like talking, confiding in you or have questions. There may be aspects of your addiction that you don’t want to talk about with your kids—likewise, your teen may have feelings or thoughts about your addiction that they don’t want to discuss with you. It’s important that you give them the opportunity to explore these feelings in a safe environment, free from the pressure of peers and immediate family. Together, designate a “safe person” who they can confide in—this could be a relative, family-friend, counselor or trusted mentor like a teacher. Let them know they can talk to this person about your addiction and how it affects them without fear of being penalized. Groups like AlaTeen can also be a comforting outlet. The longer you wait to begin the conversation about substance abuse, the harder it will be to begin. If you haven’t yet talked to your teen about your addiction, now is the time to start. If you’re having a hard time getting the conversation going, reach out to your supports at Prelude. We offer family and group therapy, or individual sessions for you (and you teen).